United States not only used depleted uranium weaponry, but provided it to terrorists fighting against the Syrian government. 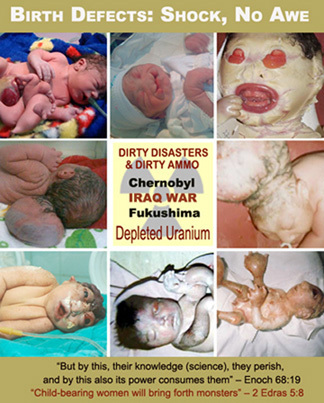 Claims an act of genocide, because the civilian population’s exposure to depleted uranium causes genetic damage, birth defects, cancer, immune system damage, and other serious health problems. “They used it all over Syria where these battles have been, but they also armed terrorists with depleted uranium weaponry. The whole country now, where the battles have been whether on battlefields or in urban regions, are all contaminated. And that has to be cleaned up before they rebuild the cities, parts of Damascus, almost all of Aleppo, and villages too,” she added. “The genetic damage to people in Iraq has been very, very extensive. I worked very closely with Iraqi doctors. I have been on tours of Japan and supported them and testified for them at press conferences all over Japan, and in other areas – Germany. We had a World Depleted Uranium Weapons Conference that was fantastic,” Dr. Moret said. “The health effects are very well-known. I made a map. I collected data from newspapers and news sources on conjoined twinning from around the world but especially from Iraq. And conjoined twinning is when two twins are born but they are attached to each other. This has always been a rare occurrence. Dr. Moret said that the “the normal ratio is 110 baby boys are born for every 100 female babies. “The US and all of its allies are using depleted uranium weapons in Iraq, but also in Syria from their first entry into the Syrian battlefield. They are absolutely lying about it. They used it and given it to all the terrorists. And they are continually resupplying it to the terrorists,” the expert said.